An unprecedented up-close-and-personal look at the trio of tycoons whose high-stakes gambles-in business-make Sin City soar.Steve Wynn. Kirk Kerkorian. Dr. Gary Loveman. The first two are world-famous for their flamboyant, often outrageous efforts to dominate Las Vegas. But it's the third-an economist from Harvard Business School, unknown even to most of the guests at his high-profile casinos-who may now have the most impact. 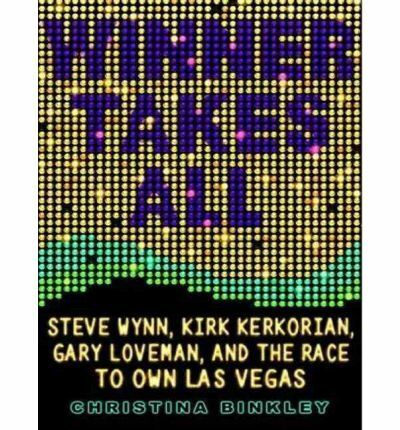 In Winner Takes All, Christina Binkley, a columnist for the Wall Street Journal, explores how these three magnates are building a bigger and better Las Vegas and how their influence is spreading beyond the city's borders.Meet the winners: -Steve Wynn is the visionary behind the Mirage, the Bellagio, and the .7 billion Wynn Las Vegas. Loud and passionate, with a tragic backstory-a world-renowned art collector, he is slowly going blind from retinitis pigmentosa-Wynn is often called the architect of modern Las Vegas.-Kirk Kerkorian, who is in his late eighties, is a shy, sly tactician, but his status as a billionaire deal maker who owns half the strip-and his history as nemesis to Howard Hughes-keeps him in the forefront of Las Vegas, wheeling and dealing.-Dr. Gary Loveman, the CEO of Harrah's Entertainment, Inc., represents a new, more populist future for Las Vegas, one in which gamblers will be carefully culled from databases rather than lured by flash. Loveman approaches the city as though it were a Harvard case study. On the verge of becoming Las Vegas's-and possibly the world's-biggest gambling titan, he refuses to even live there.Peppered with celebrity cameos (from Siegfried and Roy to George and Barbara Bush), this sharp, fast-paced narrative tells the story of how billions of dollars-and an unparalleled drive for power-took three men's visions for Las Vegas from mere dreams to reality. About the Author: Christina Binkley is a senior special writer with the Wall Street Journal in Los Angeles. Binkley joined the Journal in 1994 and has been writing about travel, hotels, and casinos since 1997. She has also worked as a reporter at the Tallahassee Democrat and the Wilkes-Barre Times Leader. Binkley is a graduate of the Columbia University Graduate School of Journalism. Actress Cynthia Holloway, a native of Seattle, Washington, has performed on stage, film, and television, as well as doing voice-over work. She has lent her voice to television programs, radio and television commercials, video games, and audiobooks. Cynthia's most recognizable work is as the voice of Anita Blake in Laurell K. Hamilton's bestselling vampire hunter series.